Yesterday I wore a fairly corporate type suit and today is the casual spin-off of that type of look. I started today's outfit with my black skinnies to which I added a black leather belt and then semi-tucked a cobalt blue tee. I then added as my third piece a more masculine style, longer pinstripe black blazer. Footwear choice was my Doc Marcie boots. For accessories I went with my oversized animal print clutch, black/white watch and a black cocktail ring. I have two different board meetings today so need to look professional and "corporate-y". 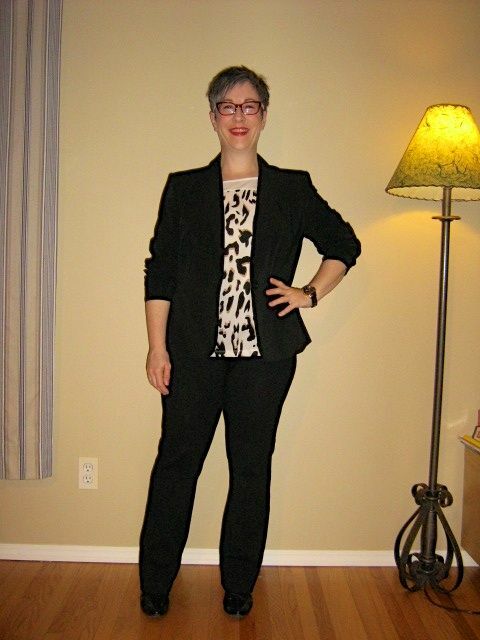 I have discovered that my black ponte knit trousers are the same shade of black and work well with my skirt suit jacket as a pant suit - don't you love it when that happens? I started the outfit with my ponte trousers (waaaaaaay too cold for a skirt today) and added my new cream/animal print mixed media top. It has dropped shoulders with t-shirt type fabric for the sleeves and back and then a polyester blend animal print front. Love it! I'm looking forward to wearing it with all sorts of combinations including white jeans when the weather cooperates. I topped that with my black suit jacket, added my black patent booties and my large cream handbag. I finished off the outfit with my rose gold/black watch, gold wedding ring, red specs and red lipstick. My happiness scale for this outfit? Off the charts. I feel powerful, professional, sleek, stylish, and modern. But what do you think? Does it hit the mark of corporate but with some pizzazz? As always, all comments/suggestions welcome. 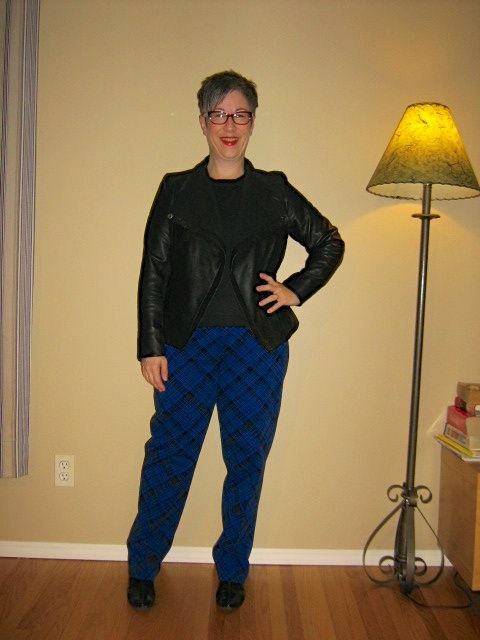 I'm trying to make these wide legged Glen Plaid "false grey" trousers work for me. I love the trousers - the drape, the comfort, the pattern, the quality - but I always feel a bit overwhelmed by them. Not today. I've decided in order to work with the volume, I absolutely MUST have some type of structure in the top half. So I started today's outfit with the trousers and paired them first with my drapey cross front silk-blend tee. I wanted to work with light colours with the trousers this time. Now I've got volume on the bottom and drape on the top - how to rein that in? Add a structured jacket. 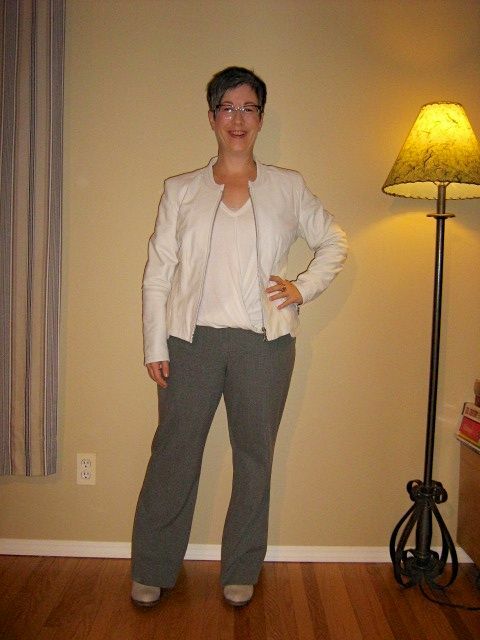 But I went with my light cream leather jacket to keep the top half of the outfit light and to add a bit of "edge" to the otherwise soft outfit. For footwear, I kept that light as well with my bone suede boots. Each time I have worn my black patent booties with these trousers, I have felt "foot heavy" if you know what I mean. I added one pop of colour with my cobalt/cream/black handbag. So am I getting there in taming these wide legged trousers? Does this work? If not, what needs tweaking? As always, all comments/suggestions welcome. I've had these leather Enzo Angiolini loafers in my cart at The Bay for a little over a week now. I had mentioned in my Spring 2014 shopping list that I wanted a pair of flat shoes in a light color. I think these could fit the bill. I also think the gold and white combo would act as a low contrast foot on my bare legs - you know, when the -30 temperatures finally go away! And the black across the top bookends my hair. What do you think? Modern classic that could work well with my style? I don't have those incredible legs of MaryK, nor do I have colourful pencil skirts or a legitimate "sassy sweatshirt" but I've been inspired by MaryK's use of her sweatshirt with pencil skirts and had to find a way to copy it with what I had in my closet. 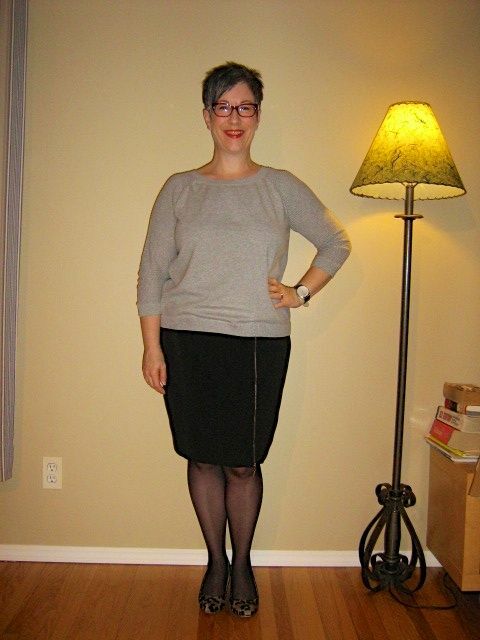 Substituting the sweatshirt, I went with my Gap mesh sleeve grey pullover and paired it with a basic black pencil skirt with a front zipper. I like how the zipper helps to give some vertical-ness to the outfit. I chose sheer black hose and then went with my animal print pumps for footwear. Accessories are all shades of red - eyeglasses, quilted handbag and lipstick. Jewelry is a simple black/silver oversized watch and silver wedding band. Although I like the outfit, I feel like it's missing some panache - probably should have gone with my cobalt pencil skirt but it's in the laundry pile. Oh well…might be cute to try with my animal print pencil skirt too with different footwear. What do you think - does it work? As always, all comments/suggestions welcome. I couldn't wait to wear these trousers that hubby/DS got me - cobalt AND black in ONE pair of trousers? Perfect! I paired the trousers with a simple black knit tank and topped that with my Spiegel leather jacket. We are back into the -30 Celcius temperatures so dressing warm is once again key. I think the length of this tank is a little too short and I'll be looking for a black longer, drapey tank or tee, but this will have to do for now. Proportions are a bit off a result. I finished off the outfit with my black patent booties and black with gold hardware handbag. Red specs and lipstick are the finishing the touches. What do you think? Does it all work together? 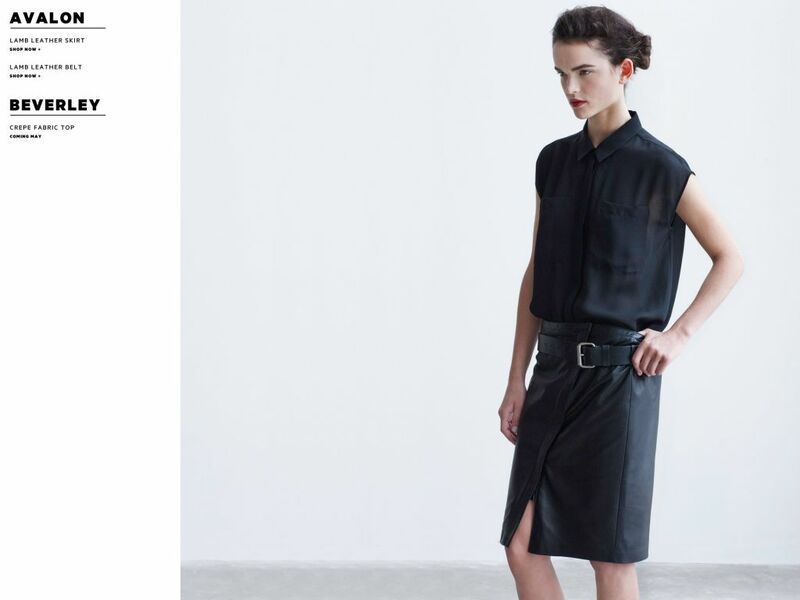 Need a longer simple black top? As always, all comment/suggestions welcome. P.S. 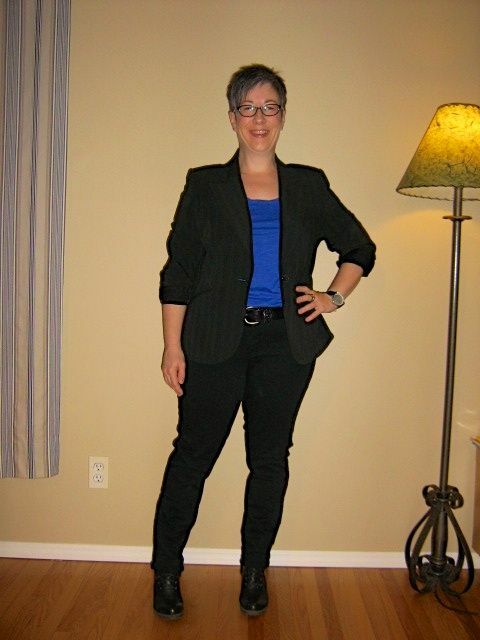 Hubby and I went to Danier Leather on Saturday with my gift card to look around and I fell in love with a blue leather jacket - sort of a cross between denim and navy blue. It's a very simple style. Slightly slouchy but not overly so, front zip, two breast pockets with zippers, tab collar, hits at my hip. It's off getting the sleeves shortened and I should have it back in 2-3 weeks. I arrived home from work today to find a box on the dining room table from my guys (hubby and DS). They totally surprised me with these two items. First is a gorgeous pair of Lord & Taylor black and cobalt slightly slouchy trousers. My hubby knows how much I like my plaid L&D trousers so snuck a look at the size tag and bought these. The fit is perfect and the colors are brilliant for my wardrobe. 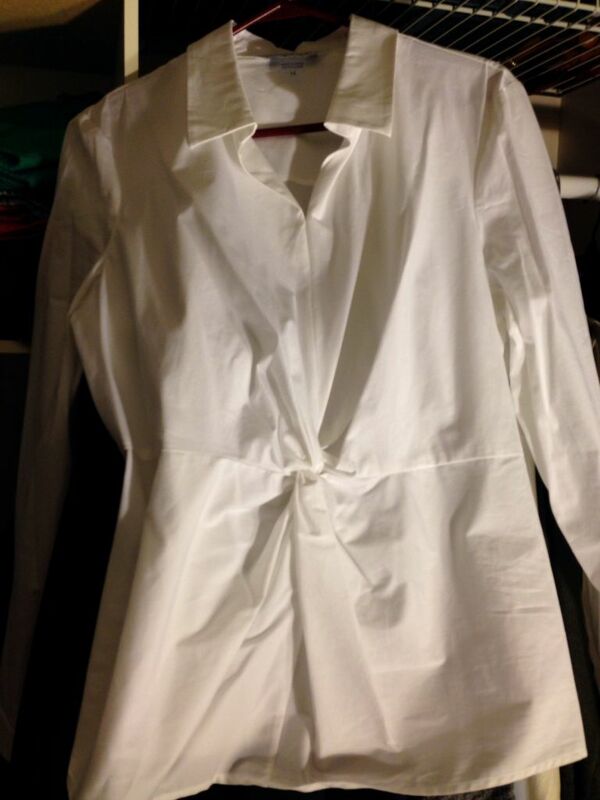 Second is a crisp white shirt - normally not something I like, but I love the large collar, longer length and best of all, the twist knot in the front. It makes the shirt interesting on its own and it looks fab with a jacket over top. And in an envelope, was a generous Danier leather gift card. No time to model these for you now but will put together some outfits soon to show you. Have spent the better part of a week going through my out-of-season closet to determine what I have for spring/summer that a) still fits; b) I still like; and c) is still stylish. Based on that, I've come up with a list that I think will work well with what I will be keeping from last year as well as with the new pastel blue suit and the EF drapey dress (which is on its way) which I've recently purchased. Would love for you to have a peek at the list and see if you think these make sense in relation to my current style. We had about three days of normal to above normal temperatures and now we're back in the deep freeze. Time to pull out the faux fur vest! I started the outfit with my burgundy skinnies and added a simple black 3/4 sleeve pullover, and semi tucked with a black leather belt. Then I topped that with my dark espresso faux fur vest. 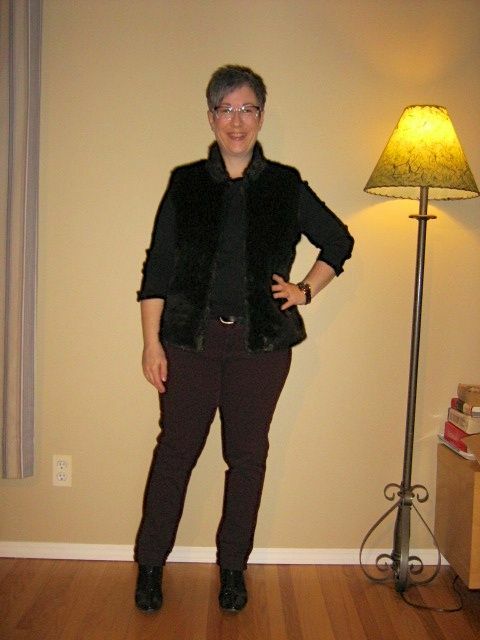 Footwear choice is my black patent booties - I like how the shine of the vest bookends the shine of the patent. I went with my oversized animal print clutch for a handbag and jewelry is my gold wedding band and rose gold/black watch. My glasses today are the purple and clear ones - I think the purple works really well with this outfit.